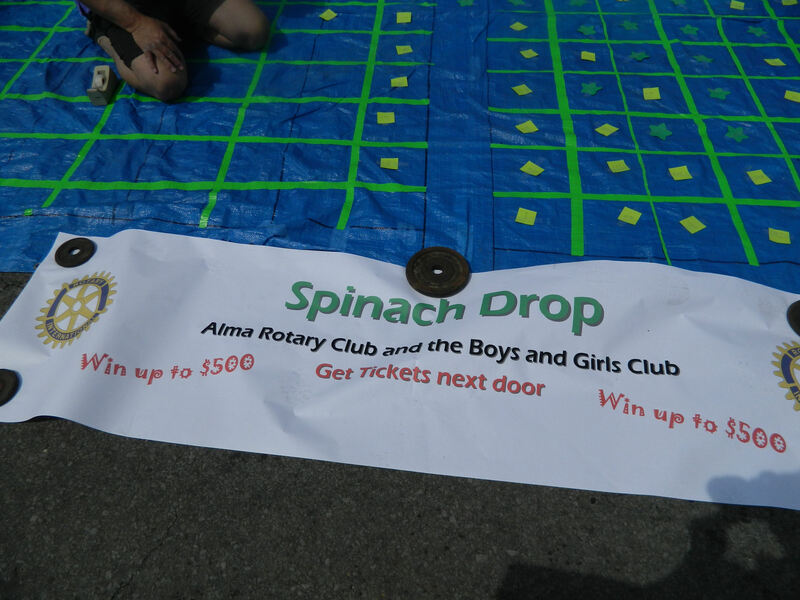 Alma’s Annual Festival Celebrates… Spinach? Visitors to Alma, Arkansas were seeing green last weekend – literally! 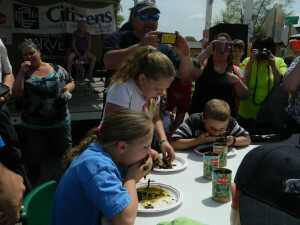 On Saturday, the city that bills itself as the “Spinach Capital of the World” hosted its 28th annual Spinach Festival. Yep, it was a full day dedicated to the slimy green stuff that Popeye credits for giving him strength. I’m in the purple hat in the audience! 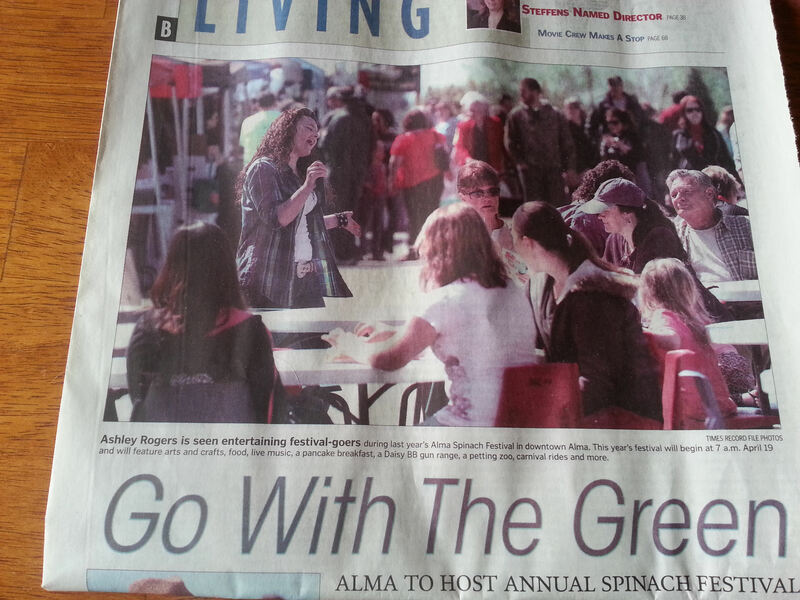 We went last year, as shown in the newspaper article above, and this year felt even bigger with more people, more events, and more fun. 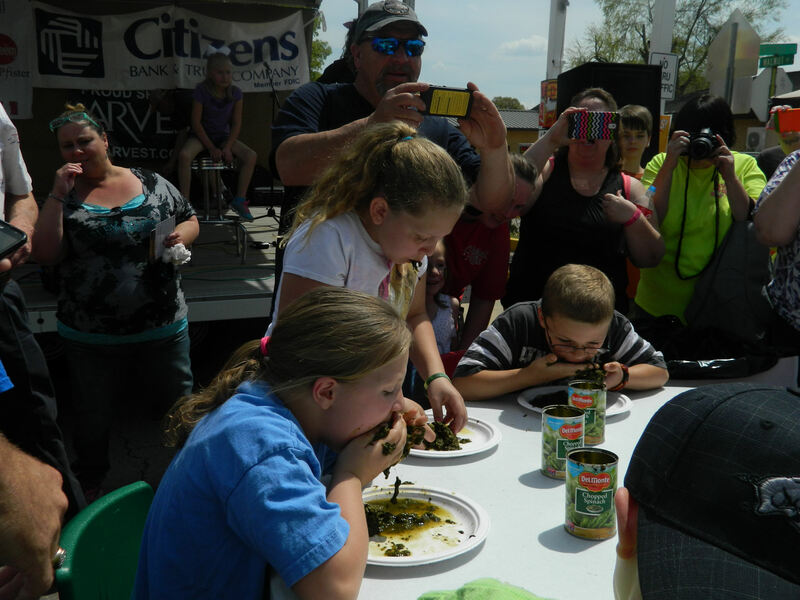 But the highlight, as always, was the spinach eating contest. 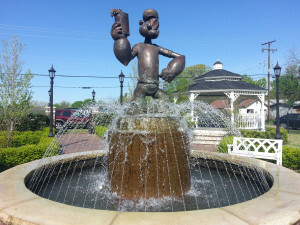 Although I love eating chips with a seasoned dip made out of cheese and cooked spinach, I’ve never had a taste for cooked spinach all by itself. 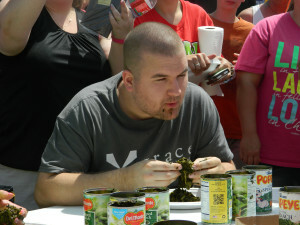 Even worse, the competitors had to eat it raw, straight out of cans and with their hands. Ewww! The first competition was for kids — and they were fierce! A young boy was named the new champion after downing 4 full cans of the stuff. Then it was time for the adults. I was impressed that 1 of the ladies was thinking strategically and used her hands to squish out all the liquid in her first serving that was on her plate and dumping it before starting. She didn’t end up winning but good for her for thinking ahead! 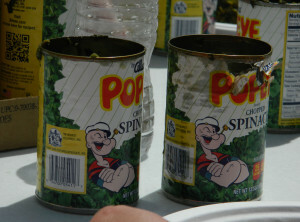 It was actually another woman who won after finishing 6 cans of spinach in 5 minutes. Impressive! 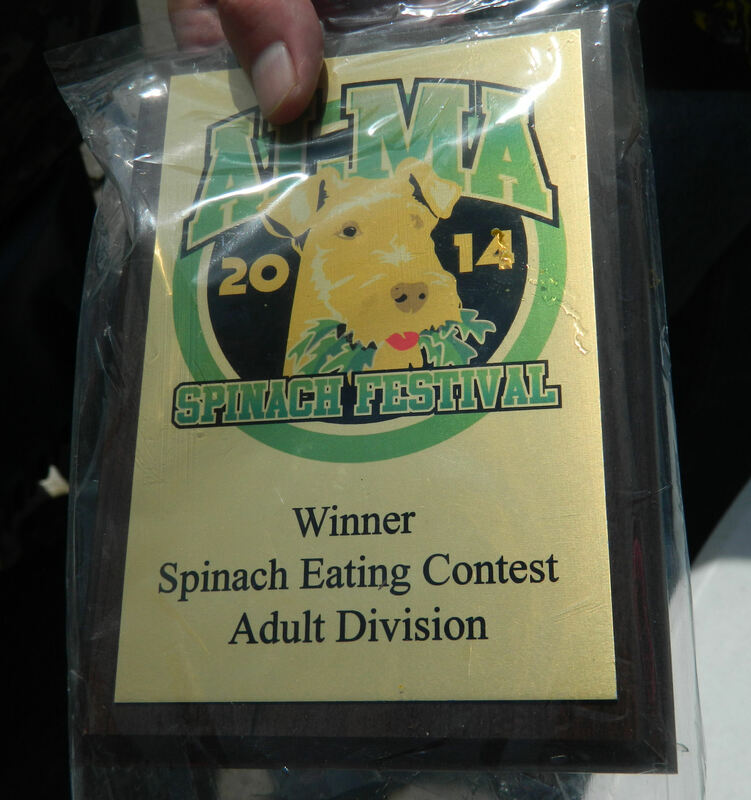 But I was a little stunned to learn that the winners just won plaques and no monetary rewards. That seemed like a LOT of work for just the small pay-off of bragging rights. But they were happy. 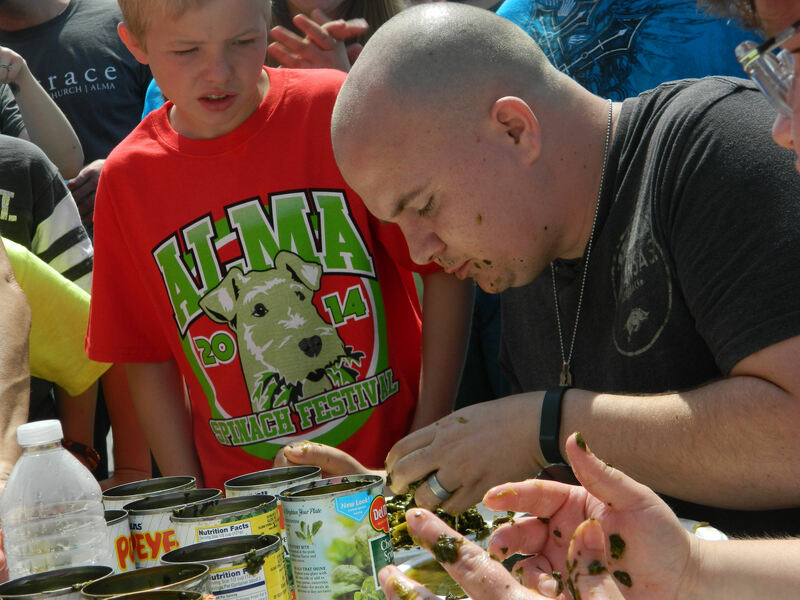 There was no way I was going to participate in that event, but I was excited to try my luck at the spinach drop. Basically, anyone could pay $5 for a random number that was then placed onto a big piece of plastic with a grid marked out on it. A ladder from an Alma fire department truck was lifted high above the plastic and a very brave, not-afraid-of-heights guy went up to the top. 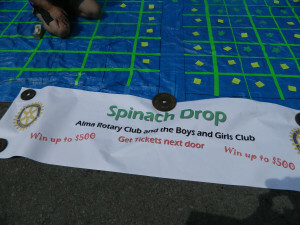 After a few problems with wind and aim, he finally dropped a well-wrapped package of spinach onto the plastic and the person who had the number where the package dropped won $500. My mom’s number was close to the drop but not so close that we needed to ask for a judgment call. Vendors selling food and crafts lined the streets, but surprisingly only 1 actually sold anything having to do with spinach (it was a loaf of spinach bread). Hmm, missed opportunity! 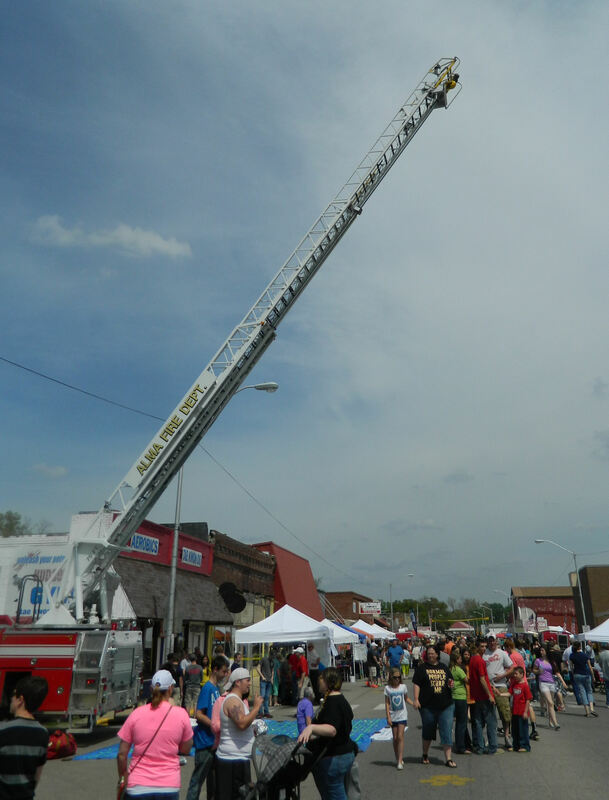 There were also live musical performances, a quilt show, a petting zoo, an inflatable obstacle course, and even a trampoline thing called the “Quad Power Jump” with kids attached to harnesses and bungees jumping VERY high and doing flips and tricks. But my favorite thing is always trying out the festival food. 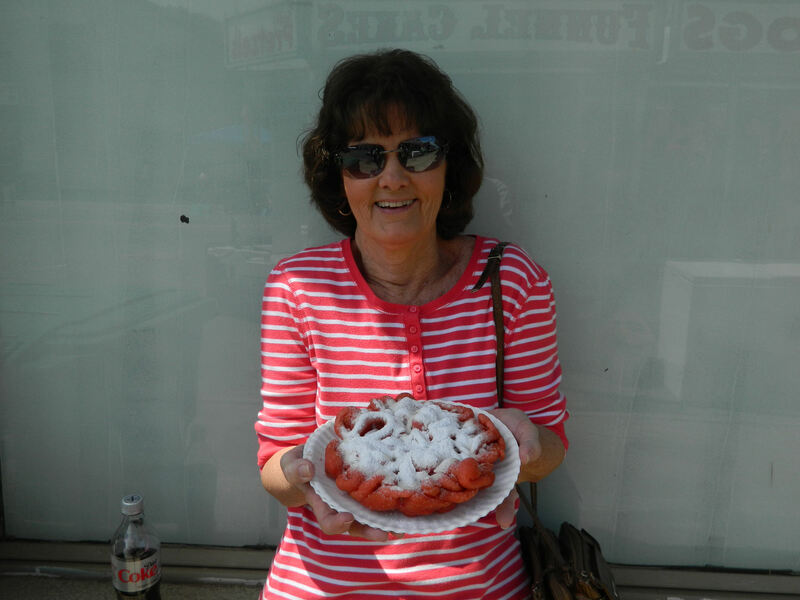 After looking at all the different menu options, my mom and I spotted something we’d never seen before – a Red Velvet Funnel Cake with cream cheese frosting. Yum! It was a great ender for a fun day. And MUCH better than 4-6 cans of uncooked spinach. What a fun day we had. The weather was perfect and there were lots of events to watch. But the red velvet funnel cake is something to be sure and try. Yep, I’m a sucker for trying red velvet anything. 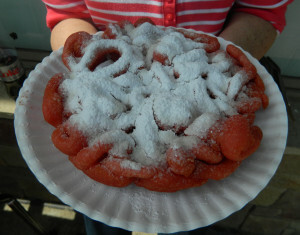 Or any crazy looking festival food item! It was Darlene! Just glad I wasn’t forced into the all-you-can-eat spinach contest. Ewww!!! 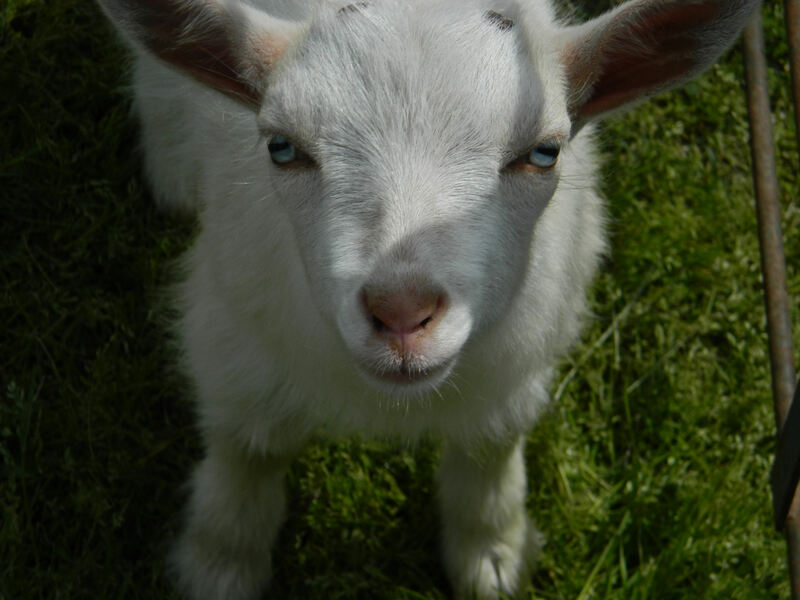 And you didn’t buy a goat to give to your dad? I know, your mom’s to blame…she wouldn’t let you buy it. 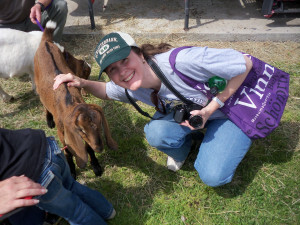 Hehe – I forgot about your goat-herding experience! No, I wanted to keep the goat for myself. I figured he’d get along great with Dakota since they both have blue eyes. I’m sure that would supersede any dog vs goat conflict. I enjoy browsing through Travel Browsing! Deborah connects me to locations I wouldn’t otherwise visit. Awww, thanks for the nice comments Elaine!